When education activists in New York, Chicago, and other urban school districts in the 1980s began the small-schools movement, they envisioned a new kind of public school system that was fair and equitable and that encouraged new relationships between teachers and students. When that movement for school reform ran head-on into the neo-conservative takeover of the Department of Education and its No Child Left Behind strategy for school change, a new model of federal power bent on the erosion of public space and the privatization of public schooling emerged. 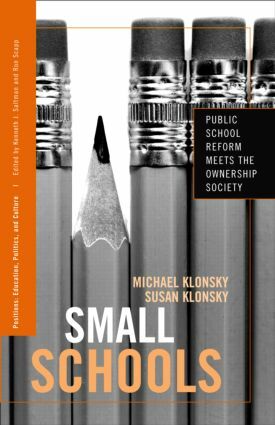 Michael and Susan Klonsky, educators who were among the early leaders of the small-schools movement, tell the story of how a once-promising model of creating new small and charter schools has been used by the neocons to reproduce many of the old inequities. Small Schools is the engaging story of what happens when the small-schools movement meets the Ownership Society.